Ben Franklin, like nearly every American printer of his era, printed using a wooden "Common Press" which was the standard printing press used throughout the world until the advent of the steel toggle presses which became available - and quickly popular - around 1780. 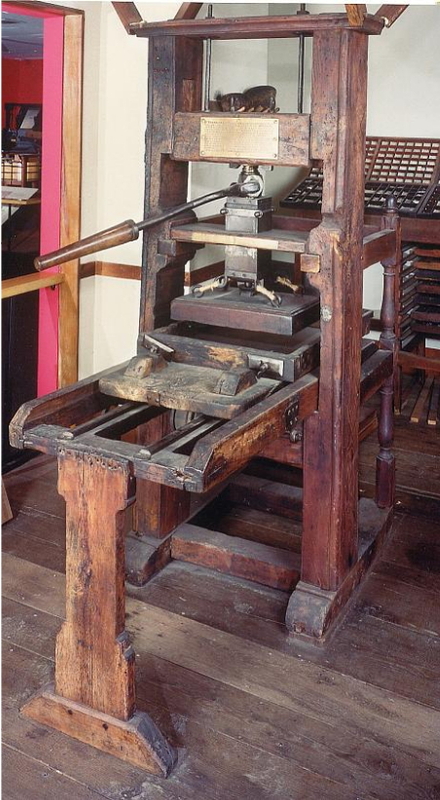 "Ben Franklin's" Hand Press was of a standard design, an essentially all-wood, floor-standing press, much like those used in both America and in Europe from Gutenberg's time until the end of the 18th century. 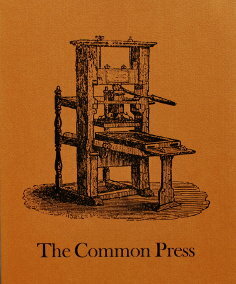 This press, sometimes known as the "American Common Press", is actually the "English Common Press. In fact, until Independence, when American Press Makers were legally allowed to build presses here, most presses used in the world came from Europe - specifically, England. In this case, Ben Franklin's press was very much like the press that would have been found in a 1750's Printing Office whether in London or Philadelphia. When we queried press historian Bob Oldham about why these presses were shipped to the Colonies from England, instead of being made here, he explained that "For the first 150 years of the American colonies almost all goods had to be purchased in England, by English law -- the colonists were forbidden to make their own." The press in the photo below is the press that Ben Franklin is reputed to have used as a young printer in England in the 1730s. It is now in the collection of The Smithsonian Institution. 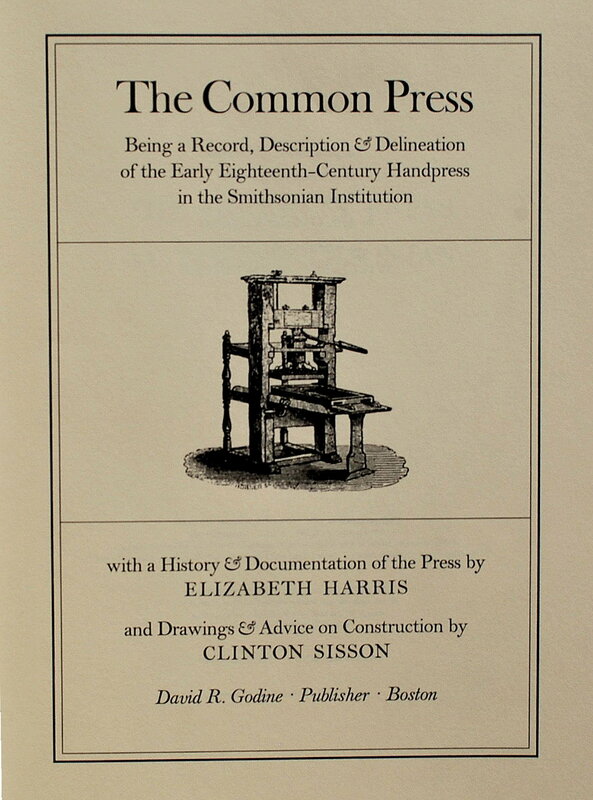 A complete report on this press can be found in The Common Press by Elizabeth Harris and Clinton Sisson - which includes the drawings used to reproduce a Common Press for a special display at the Smithsonian Institution. 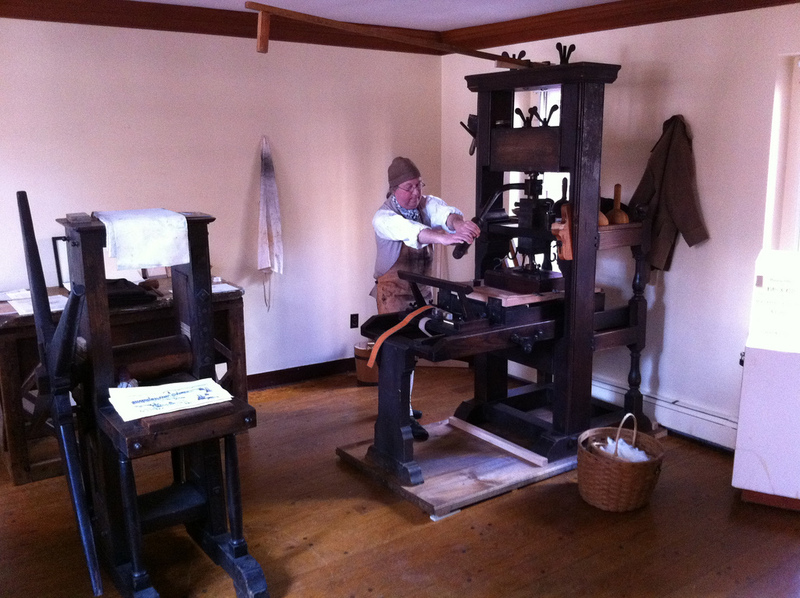 Here's a nice video of a Common Press being used at Colonial Williamsburg. 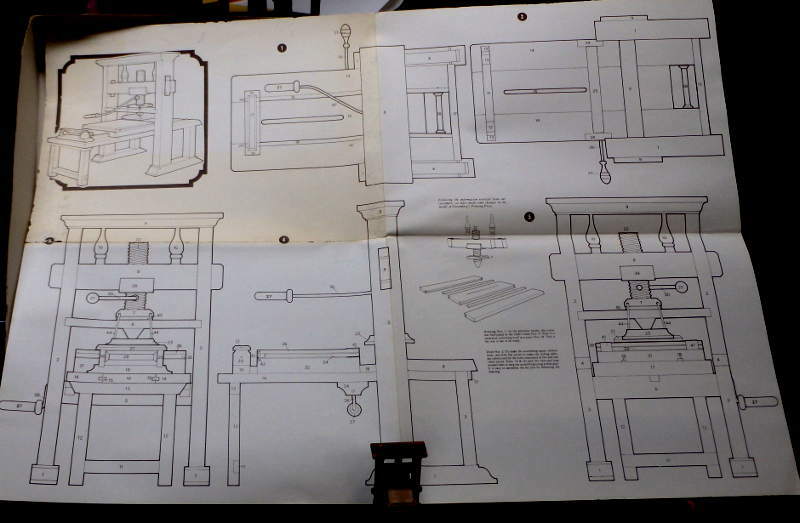 below: 1:10 scale Model of a wooden Common Press from our collection. 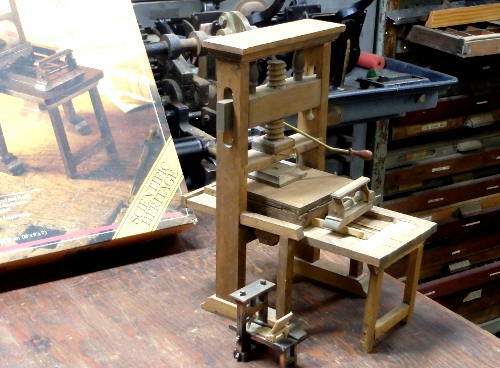 This press has been available for many years - from many different makers - as a 1:10 all-wood scale model. Sometimes it is promoted as "Gutenberg's Press", "Ben Franklin's Press" or, here as a "15th Century Printing Press". They are all about the same, however, since not much was done in press design between 1450 and 1780. The kit shown here comes complete with all parts - and diagrams to make your own Common Press. The press to the left is a full-scale, working reproduction of Johann Gutenberg's press from 1450. Press design did not change much by 1750. This beautiful press was built by Steve Pratt of Pratt Wagon Works in Orem, Utah. Before his death, Mr. Pratt built over forty various printing presses, some wood, some cast iron and steel. 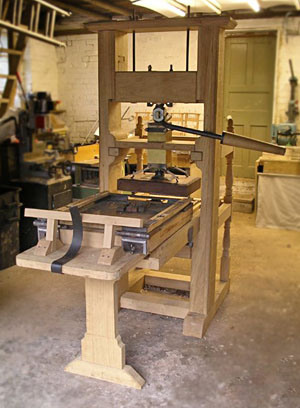 And here's a press built by Alan May in England in 2009. 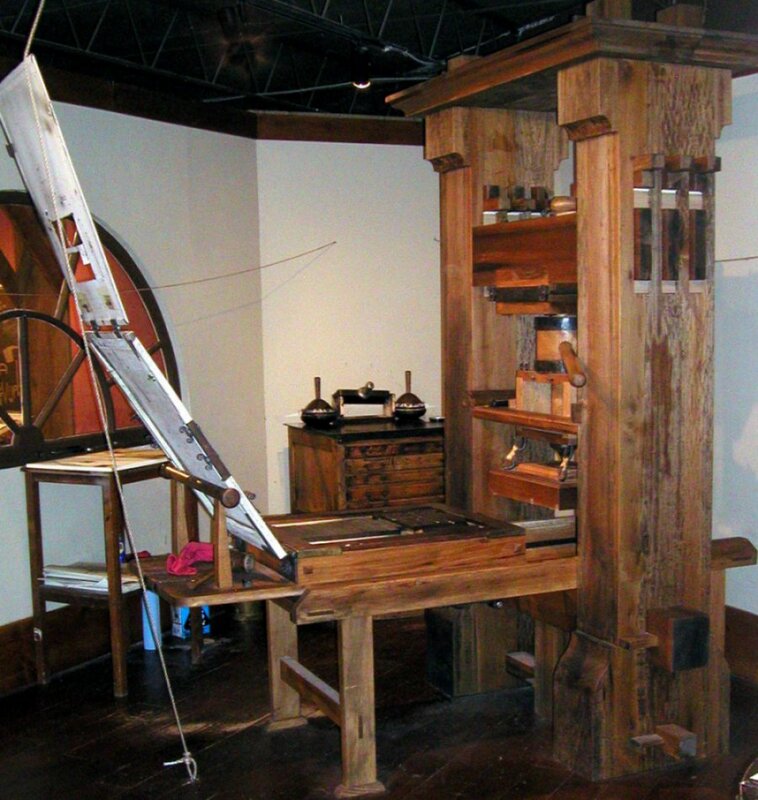 Alan May also built a replica of Gutenberg's press and was featured in a BBC documentary on the subject. Note to reader: If you have any experience in use of such a Press - or know where one can be seen in operation, please let us know - or send us a link to your own site. contact Alan if you can help.